i remembered what i was supposed to remember, but alas it was after i should have remembered it. the lack of remembering, resulted in me dripping wet cursing my forgetfulness to steal shampoo from our #1 and #2, and trying to read the small print on the '2 in 1' kids shampoo located at my feet. after much 'trying to see in focus' all i could discover was, i would smell like a watermelon.... it did not mention anything about highlighted, damaged hair and as i applied it (the fool that i am), i knew in my heart it was the 'devil's own' shampoo for women who pay to have their 'hair done' and are prone to frizzy color treated issues. i sit before you tippity tapping, smelling like a watermelon and with hair three times the volume that is acceptable in public areas. with rain outside, adding no doubt to the volumatic problems of my follicles, i shall stay inside the shed for fear of being 'fined'... until that is, 'musts' prevail when i am required to do the 'soccer run'. i shall 'don' a hat of crochet, therefore allowing for the expansion of hair matter and stay within the comfort of my car, crocheting with my piddly bit of yarn left. but for now, let us talk 'thrifty', let us talk 'handcrafted', yes dearest readers, let us talk about 'the challenge'. it would appear by my calculations that some time has passed since the 20th September, time which i must admit has not dragged, but positively raced. i do believe it is the time of year, holiday celebrations all roll into one, that is until we get to January and then it's 'drag time' like no other. to which he quickly agreed. i stopped listening when he started along the lines of "hallelujah Tif, why didn't you do this before..."
it's times like that, when i prefer the company of my chickens and my dogs. but what he doesn't know, is what i know... and i'm not sure i want him to know either. for this challenge has caused me to become an addicted thrifter like no other. my mind wanders to what thrifty delights could be waiting out there, neglected, cold, lonely, in need of a loving home. 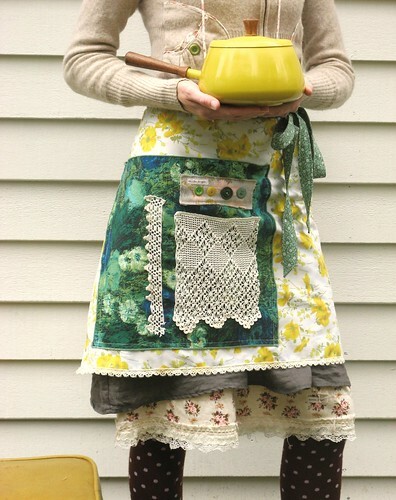 a love for kitchen items. but no where do i see their potential to enhance my cooking skills. 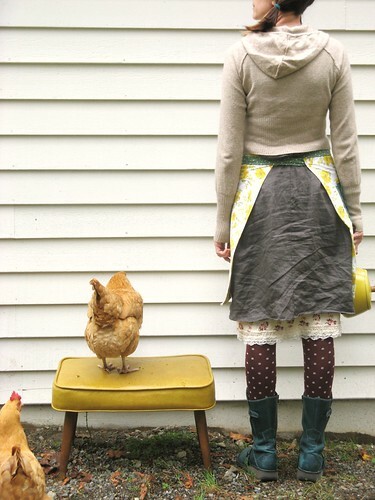 or to participate with chickens in my etsy shots. "dear god, Tif cooks an edible meal"
Oh please. Tell me how your photos are taken. By whom, where, if that is you. I love your photos. The end. 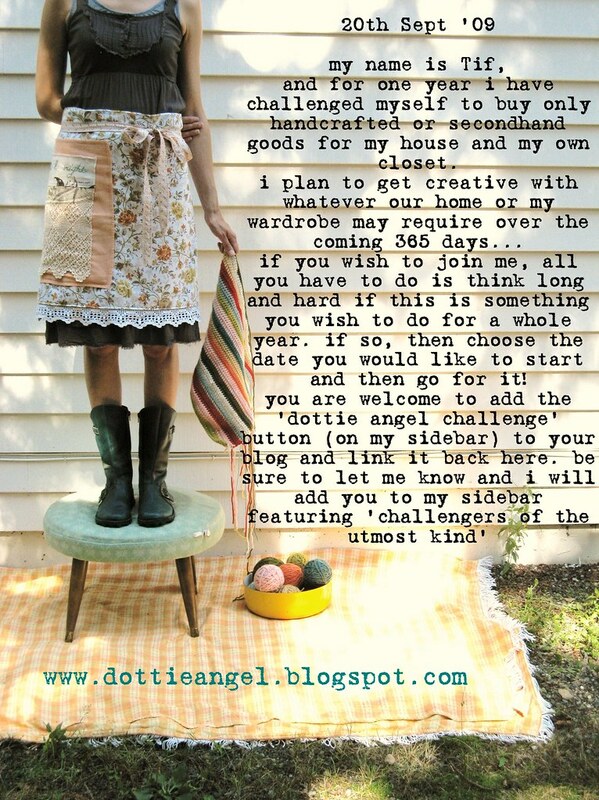 addicted thrifter, ha! join the club. you're singing the story of my life. *laughs* The title of my last three blog posts? "Thrifty Haul Part 1, Thrifty Haul Part 2 and Thrifty Haul Part 3." I have issues. I have a yellow enamel teapot which was the first thing that I ever bought in a boot fair. It sits on my kitchen shelf looking fetching, but I think brewing tea in it might pose a risk to health. It used to be a reliable source of small change for car park and school lunch money, but unfortunately now whenever I look it is empty, which is rather disappointing. My God woman - so much to comment on I don't know where to begin - but I shall begin at the beginning which is really the only logical place to, uh, begin. Thrift addiction - It is only going to get worse. Trust me. I know. Yello enamel pots - I have one exactly the same...! Ah... well, no, that is an untruth, I HAD one quite similar, only it had the addition of a folky flower print on one side - I used it & loved it a lot, until one day both the handle fell off & noodles baked onto the bottom (left a rather interesting pattern which I would have admired had I not been quite devestated). Punky now uses it outside to make dirt soup. Your boots - I want them. tif, where are your lovely boots from? I always enjoy seeing your new 'Etsy' shots. You're so creative. I have that same sweater (last photo) in burgundy. (Why am I not surprised?) :) I was drawn to the pretty floral trim and the buttons--it's all about the details! Your fat healthy hens make my moulting ladies look really skinny. Hopefully they'll get fluffed up again soon. Unlike your hair that is. I opt for not washing hair for a week to avoid big and bushy. So know what you mean, Ive turned into a thrifting hound, sniffing out the gems! Even my kidlets have been asking to visit them. Great I say. ladies, ladies... the boots again! i fear i need to be given shares in the company that made these boots, so many times have i had them admired. these little beauties in the most perfect teal color are by London Fly... they are truely the boot of a crafter, i have no doubt. P.S. Your chickens are too cute! Like tan balls of fluff sporting a mean beak! Dottie: what about the hair - will you be having it au naturelle whilst being challenged? I also love your photographs, they always look so artistic. 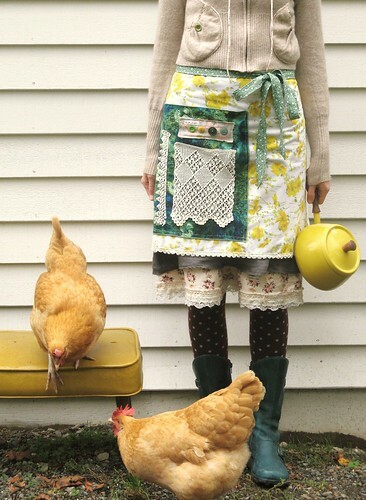 Your chickens are the cutie-cutest!!! 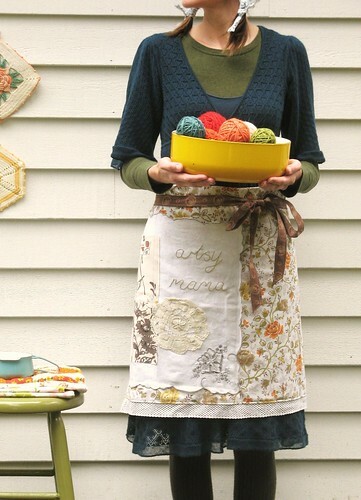 !....and I adore the aprons!!! Good for you on sticking with the challenge. I keep myself calm with one thrift run a week! i could just sit here and gaze at your pics ALL day. suppose i must do something productive though. i am HIGHLY impressed to learn that your 13 year old son take the photos for you. bravo to him! 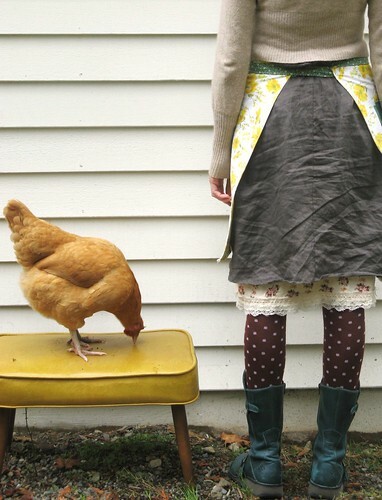 Your chickens look surprisingly at ease considering their proximity to a cooking pot (enamel, or otherwise)! I'm LOVING the pots! I'm happy to report that, although I'm not able to fully partake in the 'Challenge of the Utmost Kind' because of my budding business, I've recently purchased all new work clothes, all from the thrift. Shhhhh though, promise not to tell them. Oh I recognize those blonde chickens! They are Buff Orpingtons- one of my favoritest. Of all the different breeds I tried raising, they were always sturdy, plump, and sweet.I also love Barred Rocks. You make me miss homesteading, now that I'm in city limits, no chicks. Your photos are such a delight. Thank you! FANTASTIC. Love this Bohemian almost gypesy look and soo incredibly feminine too. Lovely, just lovely. 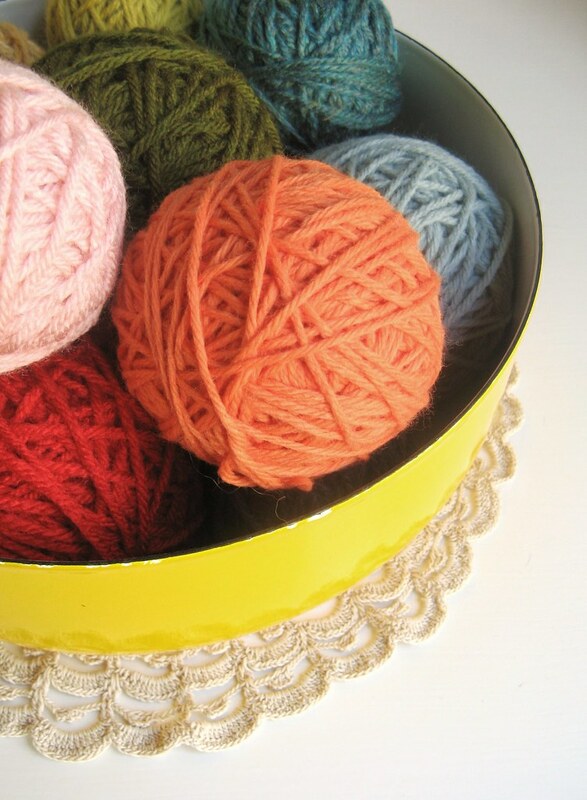 Your blog is AAAdorable and the photos are absolutely lovely! As to the thrifty challenge...you'd go nuts in my house; it's a 107 year old farmhouse that has a lot of stuff that's almost as old and in daily use. My cook stove is a 1914 Acorn and still going strong. I came to your blog via the cute garland tutorial. I'm putting together something similar and really enjoyed seeing yours.